Whether or not you're a big fan of the Oscar winning score to Gravity by composer Steven Price, you can't deny that this vinyl is pretty damn cool. Mondo, known for their amazing posters, also does pressings of soundtrack vinyls, and we've featured a few in the past (Oblivion, Halloween). 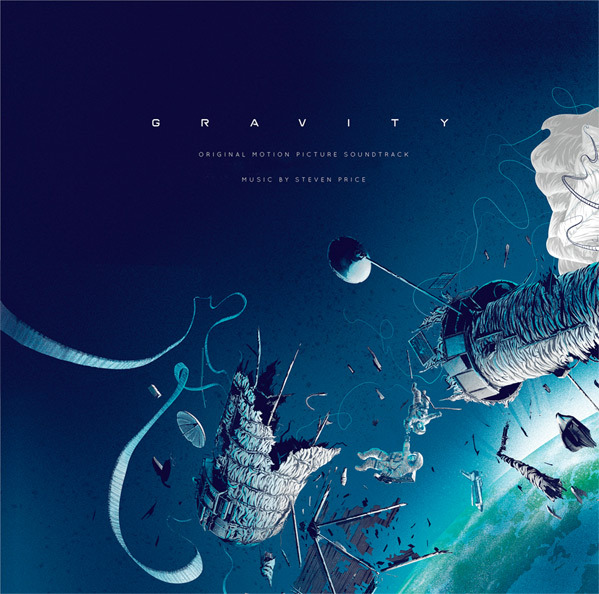 They've just announced that they're releasing Price's Gravity score on a 2XLP pressed on 180 gram vinyl. Ohhh boy this is going to sound amazing, but it could be just as good to pop in the Blu-ray with DTS. Anyway, artwork for the release has debuted on a new website announced via twitter. Check it out in full below with info on how to buy this. Click above to be taken to the Gravity soundtrack Mondo site. "Original music by Steven Price. Packaging design by Kevin Tong. 2XLP in deluxe gatefold jacket pressed on 180 gram vinyl. Limited edition pressed on black vinyl and randomly-inserted variant colorway vinyl." Anyone who is a big fan of this score, which took home the Best Score Oscar over Her and The Book Thief, and also loves vinyl, will need to own this. The pre-order for the vinyl will go on sale March 13th, 2014, Thursday, this very week through the Mondo Tees website. I'm excited to see what the actual vinyl itself (shipping May) looks like pressed and finished. I would have much rather seen a Vinyl release of the Score from Her. Totally 100% agree with you on this. I'd take both. Though I will have to say I would get this vinyl for the cover art, looks fantastic! Niceeeeeeeee!!! Seb I need ya Broh??? The soundtrack is pretty damn good, although I kind of wish they'd cut out some of the more "cinematic" stuff—I'm talking about the stupidly loud white noise that erupts out of nowhere at the end of the otherwise tranquil "Aningaaq," among other cues. Effective for the movie, not so much for easy listening.